“E-books” are electronic books meant to be read on e-book readers. 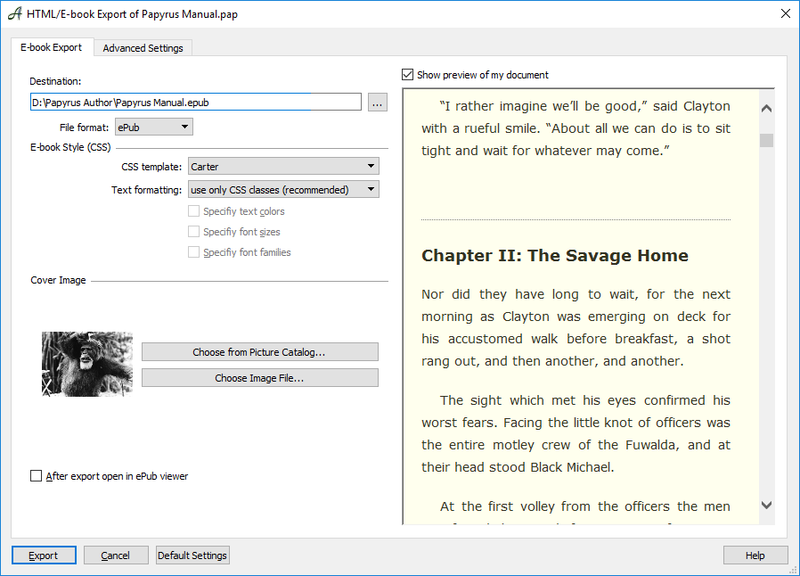 With Papyrus, you can create e-books from your documents without using any additional software. Papyrus can create e-books in the formats “ePub”, “mobi” and “HTML”. E-books are specially designed to fit a variety of layouts. An advantage of this is that their readability can be optimized for every type of e-reader. The disadvantage is, though, that you have very few layout and formatting options. The e-reader even determines what font your book will be shown in. The reader can also adjust the font size. What’s left to you is really only the plain text. 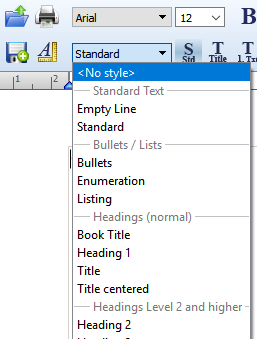 Formatting options for e-books are similar to those for standard page manuscripts. Layout and formatting decisions are not translated into the e-book. What’s more, e-books don’t have a paper format and, thus, don’t have pages. “The end of the page” is a rather arbitrary term when it comes to e-books. It varies across e-readers. E-books do have a table of contents, but without any page numbers. The only useful formatting differentiation is to set apart your text in headings and running text by using style templates. There is one important formatting option, though, that you do have. An e-book, just like an internet page, consists of HTML pages. There are templates available to format HTML, known as “Cascading Style Sheets (CSS).” These are also used for styling e-books. Papyrus has many varieties of beautiful CSS templates for you to use. Just switch the templates in the e-book dialog and use the preview to see how your e-book will look. Start however you like–with a blank page, a template or a complete project. For pictures in an e-book, you can only control the position and the size at a very rudimentary level. Every e-reader has a different idea of where your pictures will go and how big they will be. Arrange your pictures so that they still make sense if the size or position is changed. The table of contents should be created without page numbers, as e-books don’t have fixed page sizes (see above). Generate your e-book by selecting “File” → “Export”→ “ePub“/“mobi” or “HTML”. 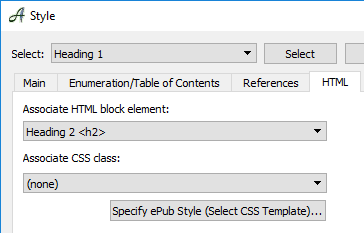 Check your settings, choose a CSS-template you like and simply generate your e-book. In the “File Format” pop up you can decide between the e-book formats “ePub” and “mobi” or choose HTML. The “ePub” format is the standard e-book format for all major non-Amazon publishers. It will read well on Kobo, Sony and other devices. The “mobi” format, on the other hand, is the e-book format of Amazon and is optimized for all Kindle readers. Our “mobi” is generated with Amazon’s KindleGen software. This follows KDP (Kindle Direct Publishing) recommendations and will likely bring you a better result with your e-book on Amazon. Under “CSS Template” you can choose how you would like your e-book to be formatted. 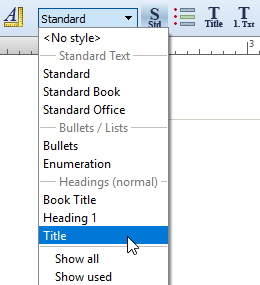 If you use our style templates in your document (“Standard,” “Title,” “Heading 1,” etc. ), Papyrus will easily turn your text into an e-book. Your own style templates must be assigned a CSS Class (in “Paragraph” → “Style” → “HTML”) or Papyrus will choose a suitable class for you. If you have selected “Show preview of my document,” you will see the first 20 pages of your own text as a preview instead of our example document. You also have the option to set a cover image for you book. Simply use the first page of your Papyrus document. The cover image you choose for the first page will appear on all e-book readers as the cover image for your book. Clicking on the “Picture Catalog” button will bring you to the catalog, where you can use the context menu to select any picture as the cover image for your book. In that case you don’t need to make the first page your title image. Papyrus will remember to insert the cover image later when you export to an e-book format. If you select “ Display exported document in associated reader,” your freshly generated e-book will be opened directly with the e-book reader program on your computer (if you have one installed) for you to take a look at it. By hitting “Generate” you can finally create your new e-book. The ePubs generated by Papyrus Author follow ePub standards set out by the International Digital Publishing Form (IDPF–www.idpf.org). The advanced settings for e-books help you set resolution and quality of pictures in your e-book as well as convenience features like extended footnotes. E-books do not need as high of a resolution for pictures compared to a print medium. If you set a lower resolution for the images in your e-book, you will be rewarded with a lot smaller file-size. Some e-book publishers take relevant parts of your sales depending on the file-sizes of your e-books. Smaller files will yield higher profits. Of course, a nice-looking graphic for your title picture influences the success of your e-book. 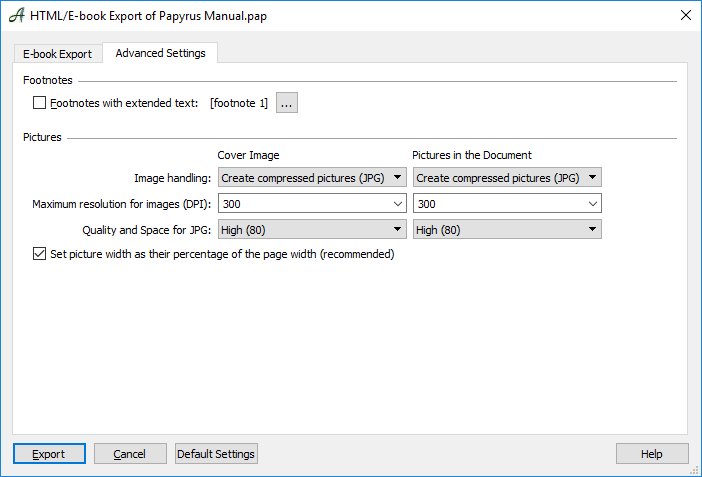 It needs to look good on an e-reader and in an e-book store.Therefore, Papyrus Author offers picture quality settings for the cover image and all other pictures in your document. JPG files (sometimes “JPEG”)–especially when considering photographs–need less space than other file formats. Depending on your preferences, you can convert all images in your document to JPG to save space. Higher quality levels will mean higher amounts of disk space needed. Also set here whether your picture widths should be set as they are percentage-wise to the page they appear on, or with an absolute width. For e-books, we always recommend the default percentage-wise approach. “Footnotes with extended text” is a convenience feature for e-books. Usually, the numbering for footnotes is very small. This makes it hard to touch them on an e-reader and jump to the content of the footnote. Papyrus can extend the text of a footnote so it is easy to use on an e-reader device. If you use Papyrus’s style templates, everything is already setup for the export as an e-book. You don’t have to do anything extra. The headings do need to be labeled as “Title,” or, if they are numbered, as “Heading 1,” but that’s it. The remainder of this sub-chapter is for those who want to understand more about how templates and e-books work. E-books consist of HTML pages, so the layout is determined by HTML tags. Using this table you can set the appropriate HTML tag for your style template in the style template dialog ( icon in the toolbar). This will allow you to seamlessly export your document as an e-book. Your running text style templates should be assigned a <p> under “Associate HTML Block Element,” headings should be assigned a <h2>, and so on. Our CSS templates can be found in the Papyrus folder → Modules → Templates.css. There are also bitmaps to change the font and appearance of your e-book that can be used with a CSS file. If you want to create your own CSS template, you can copy one of these folders and edit it. Or you can make your own folder. This folder will then be displayed in the ePub Export Window.